Since 1999, AVS has been creating state of the art, custom, reliable and intuitive automation systems to drive and support our client’s business needs. AVS has extensive experience designing smart home and integrated commercial technology systems. We are able to provide valuable discussion and insight about what products and solutions work best to achieve a desired result for your home or business. We advise on what brands and technologies are reliable and which integrate well with others. We spend the time to council our clients on the latest innovations and trends and get their questions answered. With our collaborative approach expect to get ideas and creative suggestions on how to incorporate technology to enhance your life at home or for a business. We will also let you know what to avoid or where to proceed with caution, which can save time, money and frustration. AVS will work together with Architects, Designers and Engineers to ensure each client achieves their end goal. Clients are provided with detailed documentation of the technology plan during each phase of the project. Collaborating with other design professionals involved with your project to address functionality, installation and finishings. A highly performing vehicle is only valuable if it does what you expect it to do. The same holds true with the user interface for your integrated technology system. Control systems continue to bring together more sub systems from audio/video, media, lighting, shading, climate etc. We make sophisticated technology easy to use. Our programmers will create a system that is both intuitive and functional to your specifications whether you’re using a touch screen, keypad, remote, or smart device to control your system. A smart technology project takes effective planning, organizing, and allocating resources to make sure it’s completed on time, and with the desired result at fit and finish. Additionally, procedures and protocols need to be met and unforeseen problems should be resolved quickly. Our dedicated project managers oversee all details and consistently communicate with the contractor, subcontractors and owner. 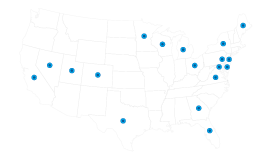 AVS has had the pleasure of deploying technology solutions for clients throughout the continental United States and beyond. Each project is unique and has many moving parts. Choosing to work with a solid and experienced company in technology integration in which to bring it altogether makes all the difference. As conference room technology continues to evolve supporting collaboration around the world, AVS partners with its customers to design and implement rooms that are both reliable and easy to use. From the simplest of huddle spaces to executive boardrooms for Fortune 500 companies, AVS has designed and integrated a wide range of conferencing spaces. Ease of use and reliability lead to adoption and these are our top priorities when designing any conferencing space. We have implemented some of the most cutting edge conference spaces in the world and continue to innovate and adopt new technology with the focus on making these spaces effective and effortless. AVS has been helping clients develop intuitive and cost effective audio visual control system solutions since 1999. We create control solutions for the simplest of conference rooms through network operation centers, large hotels, auditoriums, performance art venues, sports arenas, themed restaurants and more. Whether a client is looking for full control of conference room audiovisual technology only or full control of the environment including, shades, blinds, lighting and HVAC, HB develops control solutions that are reliable and easy to use. A well-designed control system is critical to create a simple user experience. AVS can integrate technology within your home to make controlling everyday needs like lighting, music, shading, house climate and shade/drapery systems easier—all from an easy to use touchscreen device. AVS creates user-friendly graphic interfaces that are intuitive and custom-designed to suit your preferences. Not home? AVS can enable total home control remotely via iPad, iPhone, Blackberry, Android, and E-Control X-Panel devices to suit your preferences and needs. Creston Enterprise Room Solutions optimizes workflow with a single platform. AVS integrates Creston automation for home automation systems with remote access capabilities for home and office needs. AVS is a full service audio/video automation company that specializes in intuitive and reliable systems that exceed client expectations. Our exceptional service and attention to detail from fit to finish is why our clients hire and refer us. Our success can be attributed to the focus we place on each project, intelligent design, expert craftsmanship and white glove service. From simple entertainment systems to advanced automation, let us show you how technology can enhance your business and lifestyle! If you would like more information about Audio Video Solutions, NJ LLC. or a question, please let us know. We will get back to you shortly.